At times, the Internet can be a very negative place. Like Louie CK said, people will just spout off mean comments to a monitor screen and feel no remorse as they do not see the anguish they cause. Furthermore, if you cause a stir on the Internet, you'll garner more of those coveted pageviews, so people are incentivized to generate controversy, and being a Negative Nancy is a fairly easy way to ruffle people's feathers. I've been very proud of the work at Legends Of Springsteen over the last two years, as we have maintained a positive attitude (well, not always) while being completely honest in our thoughts and opinions about Springsteen. With that being said, I hesitated before taking on the task of reviewing Working on a Dream. 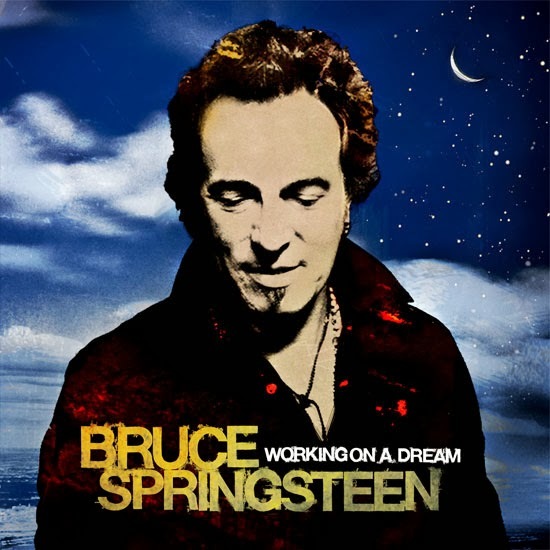 Five years ago today, Working on a Dream, Springsteen's 16th studio album, was released. There was a massive promotional campaign behind it, and, given its timing, it could have been called Obama's Inauguration: The Soundtrack. In order to sell the album, they pulled out all the stops, from Springsteen's fantastic Super Bowl performance, the inclusion of a Golden Globe winning song, and a sprawling tour featuring an epic five-night stand to close out Giants Stadium. And, it was five years ago today, that I began my hatred for this album. My initial impressions of the album were: this is too nice. Springsteen's too happy. Gone was the angst, frustration, and sadness that made Magic one of my favorite albums just a year-and-a-half earlier. Every other song seemed to be about how fantastic everything was: his day was lucky, he fell in love at the supermarket, and he was throwing someone a surprise birthday party! I immediately dismissed it as the worst Springsteen album ever, and, aside from "The Wrestler", I never found myself playing any of the songs again. I liked a few songs. "What Love Can Do" is a Goo Goo Dolls-esque rocker, which, for those who know me, is actually a compliment. It's simple, catchy, and, most importantly, short. Many times on the album, the songs have a good idea, but they last too long and the song becomes boring, such as "My Lucky Day", "This Life", and "Outlaw Pete" (which I thought reached its conclusion three times before it actually did). "What Love Can Do" is a song I didn't even remember before going into this review, so I had no preconceived notions to battle against. There were, however, two songs I did a complete reversal on: "Working on a Dream" and "Kingdom of Days". I was actually shocked by how much I enjoyed "Working on a Dream" when re-listening to the album. It is very sweet and gentle, and I can easily see how it was adapted into a lullaby. Bruce's voice also sounds incredible in this song, as he sings softly, without the growling and shouting that are trademarks of every Springsteen impressionist. As for "Kingdom of Days", I recall debating this fellow writer Steve at the time, where I got too hung up on the lack of subtlety in the "I love yous". However, the song has some fantastic lyrics, making it a strong choice for a wedding like "Happy" and "If I Should Fall Behind" (in fact, far-to-infrequent contributor James did have this song played at his wedding). Unfortunately, these three songs were all the positivity I could take. My initial thoughts of the album were that it was too "happy", and, five years later, this remains unchanged. Following "Outlaw Pete", we are treated to five songs, about 20 minutes, of Bruce loving the world. Don't get me wrong, I'm not a dour man, but after wave after wave of good-feelings, the dark tones of "Good Eye" were a welcome respite, even though it has an annoying distorted vocal. And, shortly after that, it's back to the good moods with the honey-dripped "Tomorrow Never Knows". The overt sweetness and lack of variety makes this a tough album to get through. Additionally, this album features some songs that are so bad, they elicit laughter. "Outlaw Pete" has some good ideas, but those ideas were already covered in KISS's "I Was Made For Loving You". Aside from that, it is eight-and-a-half minutes dedicated to man who's introduced as a Coen-brothers-esque baby bandit. "Queen of the Supermarket" reminds me of the classic Dana Carvey skit where he's making up a song on the spot. "Surprise Surprise" seems like one of those songs characters would sing in a television show when they couldn't pay for the rights to sing the "Happy Birthday" song. Overall, it was a very up-and-down experience to go back and listen to this album five years later. For every song that got me thinking "Hey, this isn't too bad", there was another that was even worse than I remembered it. It may not be Bruce's worst album of all time, but I still can't fully endorse it. I would give it two dreams out of five. That being said, if you'd like to order the album, click on the Amazon banner below! Bruce On Jimmy Fallon: Beware of Ducks!